The Robens Trail Tent Range comprises 19 light, practical, full-featured, durable, technical shelters for anyone from solo hikers to groups of up to eight people. They are designed to offer numerous options that address the needs of those adventures taking part in general outdoor pursuits. Performance is guaranteed using quality materials, like our new Hydrotex HD RS ripstop polyester and Yunan aluminium alloy poles. 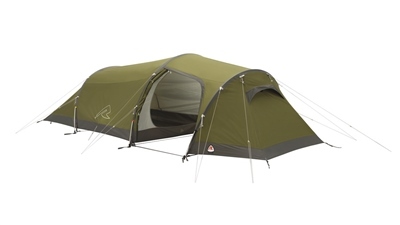 New models include the voyager versa 4 and 3 tunnel tents that feature an outer that can be rolled away in a various combinations to make the most of sunny weather. The tipi-style eight-berth Field Tower is also introduced to offer a base camp tent with a large porch entrance that provides a wet area when needed.